A Handful of Sand by Marinko Koščec and translated from the Croatian by Will Firth, is billed on its blurb as an ‘ode to lost opportunity’ but I think it’s more than that. I think it asks, is it ever possible for psychologically damaged people to love? 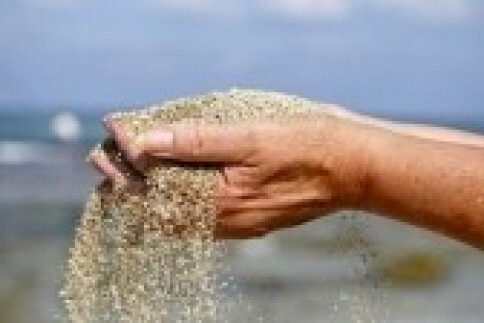 Or is it that they can only ‘sample’ what others have, only to lose it like sand slipping through their fingers? The story is told as a ‘duet for two narrators’ who are never named. To keep track of them in my notes as I read, I christened them by the font that was used. He became TNR (Times New Roman) and she became Ariel (although that’s not how the font is spelt, I know). What was just a device to keep track of the alternating perspectives became emblematic of how I felt about them: although she shares few of the qualities of her Shakespearean namesake she is ethereal, imaginative and irritated by moral ties. TNR’s blunt initials became representative of the sense of alienation I felt from him, a sense confirmed by his loathsome behaviour as the relationship soured. (Those words ‘You belong to me’ are always a portent of dangerous possessiveness, IMO). For most of the book the characters explain their background, but I was never sure who their ‘audience’ was. Both slip easily into anecdotes that are like the stories couples tell each other as they get to know one another, but at times these stray into absurdity. At one stage he tells the story of a breakup, with a girl he’d lost interest in anyway, and how he rampaged about, tearing windscreen wipers off cars and biting the ears of the hapless drivers, until a butcher takes an axe to him. Is this a fantasy? A guilt trip? A metaphor for something? On the other hand, often these narratives seem like intensely private thoughts, reflections on the past which are not shared with the lover. What’s striking is how often these anecdotes are gruesome. A schoolmate reads a tribute to his dead rabbit in class, only to reveal later that it was he who killed it. A mother who incinerates kittens. Friends, relations and acquaintances are described by a catalogue of disasters to have befallen them: illness, psychiatric disorders, injury, death, suicide, the Holocaust. Both have dubious parentage, and the dreary parents of both are damaged people too, incapable of forming relationships themselves and making psychological demands on their children that cannot be fulfilled. There are comic moments in this novel. The mocking description of the publishing industry he works for is an amusing satire, and The Holiday From Hell is full of black humour. There’s a droll scene where he has to abandon his car to pursue her on the tram and comes back to find it impounded. But overall, this novel is a portrait of a doomed relationship, charting the depression beforehand, the brief rapture and the bitterness of loss. For Koščec, it seems, the life experiences that make us who we are, are not merely scars, but wounds so deep that recovery isn’t really possible. Stu from Winston’s Dad reviewed A Handful of Sand too and noticed its debt to French existentialism. It was interesting to see that he identified more with the male narrator than I did!